Coral reef communities may be negatively impacted by sewage pollution either directly or indirectly. 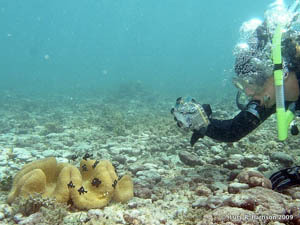 Organisms on lagoonal reefs may be particularly vulnerable because of limited water circulation. My research examined the relationships between water quality, benthic community composition and fish community composition of coral reefs along a potential sewage pollution gradient in Tanapag Lagoon, Saipan. I found that environmental factors unrelated to sewage, namely salinity and dissolved oxygen, were identified as the main drivers of variation in benthic community composition. Differences among reefs in fish community composition were best explained by variation in abundance of branching coral, macroalgae, turf and coralline algae. Although no sewage proxies were highlighted as important correlates of variation in fish and benthic communities, managing water quality to maintain reef resilience remains essential.